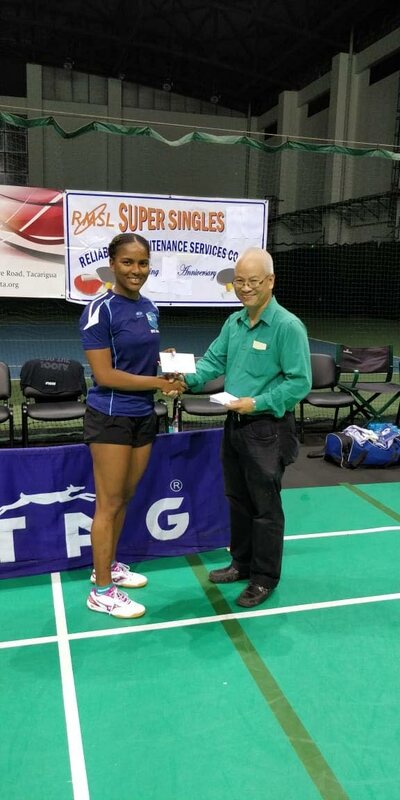 THE Queen’s Park Table Tennis Club did a one-two at the RMSL Super Singles Table Tennis Tournament 2018 on Wednesday as Shemar Britton and Brittany Joseph, took first place positions in the men’s and women’s divisions. The champs were decided after an interesting round robin battle at the National Racquet Centre in Tacarigua on Wednesday evening. Britton went through the round robin without a loss, leaving him at the top of the table populated by six finalists. The Queen’s Park Table Tennis Club member beat Luc O’ Young in four sets (11-3, 9-11, 11-9, 11-6) to take the championship. He took home a $2,200 cash prize for the first place position. Arun Roopnarine took second place, Curtis Humphreys came in third, Luc O’ Young came in fourth position and Aaron Edwards and Dayanand Maharaj took the last two spots. In the women’s division of the championship, Joseph also made a clean sweep, beating four other finalists. Her last match against Shreya Maharaj ended 3-0. Joseph took home an $1,800 cash prize. Catherine Spicer came in second in the women’s division, while Linda Partap Boodhan came in third, Aleema Edwards came in fourth and Shreya Maharaj came in fifth. “Tonight had some successful matches but I am very happy that two Queen’s Park team members came out on top. They worked very hard and trained four to five days a week for about three hours a day,” said coach Aaron Edwards. Both champs said the matches were hard fought, and expressed excitement at winning the trophies. Reply to "Britton, Joseph win RMSL Super Singles"